It’s official: 2012 was the warmest year on record in the lower 48 states, as the country experienced blistering spring and summer heat, tinderbox fire weather conditions amid a widespread drought, and one of the worst storms to ever strike the Mid-Atlantic and Northeast. 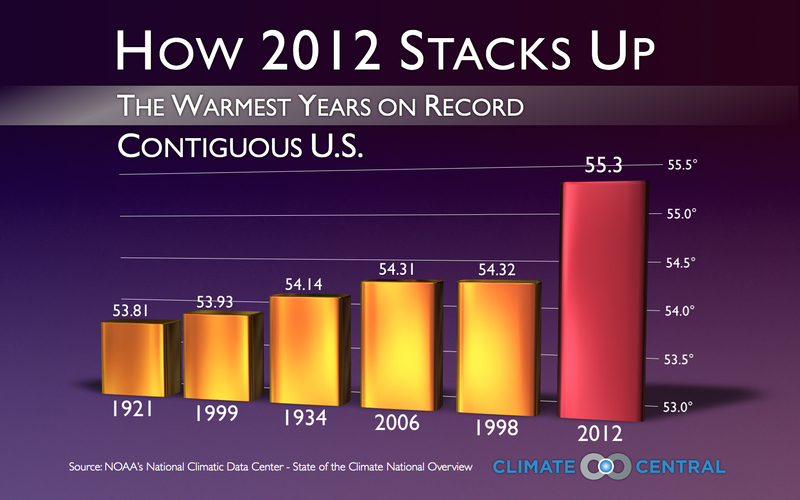 Above is a snapshot of how 2012 stacks up against the five other warmest years, all but one of those years recorded within the past 15. That’s consistent with the global warming trend driven by increasing carbon emissions. Every state in the lower 48 notched an above-average annual temperature last year, although not all the states set a record. Climate Central has a new interactive for a state-by-state analysis.